Well it goes like this. I met a girl and she was all crazy about 4x4ing and camping. 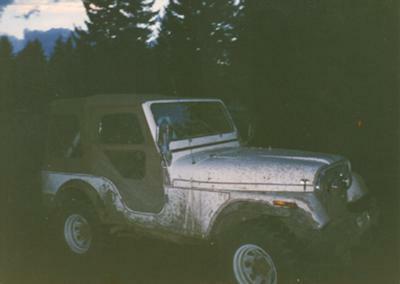 I hit the jackpot and I thought to my self, I need to start my quest to find that perfect CJ5 I wanted for some good times in. I found her on a lot like 80 miles away. I went to test drive her and drove home with a big smile because I had found her. So after sleeping on it I called the car lot and said I want it, let's do it. It was a 1980 AMC CJ5 Jeep, white with a nutmeg top and matching black and nutmeg seats, lots of stainless and very nice pin strips. I could not wait for the next two days and I would be driving her home. I called her Nelly. 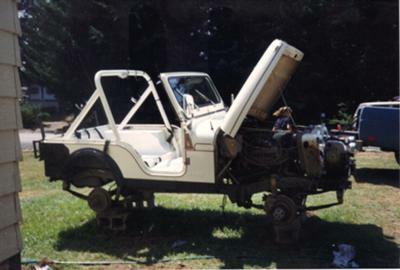 I ran this Jeep on and off road for years and had put in a lot of time to build her the way I wanted her. 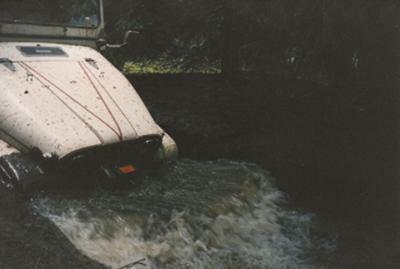 She had a 327 350hp V8, T176, Dana 20 rear-end with track lock, and a Dana 30 up front with 4.10 gears. It also had duel exhaust and H78x15 tires, power steering, tilt wheel and was very smooth to drive. 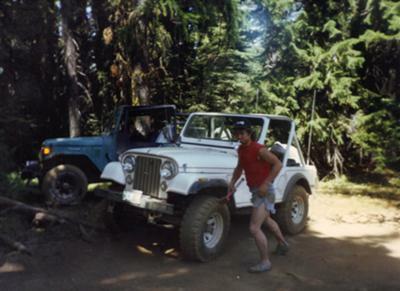 I have this CJ5 still to this day. Bought it in 1989. Larry's Comment: Great story, Larry! I have just one question: what happened to the "4x4ing and camping" girl that started all of this? I made her my wife and friend for about 8 years. We got married out on one of our camping 4x4ing trips. We had two boys and after our split the boys and I kept camping and 4x4ing. Now my youngest boy has a '65 Jeep CJ5A Tuxedo Park Mark 3, and my oldest has a '60 International Scout. Editor's Reply: Thanks for the clarification, Larry. I hope I didn't come across as being nosy or out of line. No not at all. She and I are still friends. I do have to thank her for all the great 4x4ing we did and the camping trips.